We’d love your help. 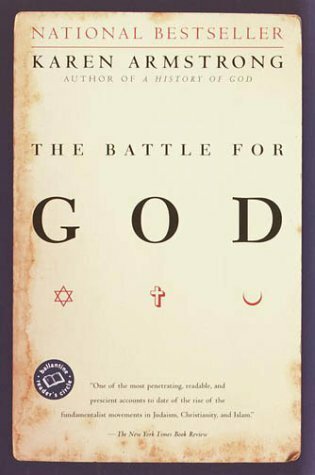 Let us know what’s wrong with this preview of The Battle for God by Karen Armstrong. In our supposedly secular age governed by reason and technology, fundamentalism has emerged as an overwhelming force in every major world religion. Why? This is the fascinating, disturbing question that bestselling author Karen Armstrong addresses in her brilliant new book The Battle for God. Writing with the broad perspective and deep understanding of human spirituality t In our supposedly secular age governed by reason and technology, fundamentalism has emerged as an overwhelming force in every major world religion. Why? This is the fascinating, disturbing question that bestselling author Karen Armstrong addresses in her brilliant new book The Battle for God. Writing with the broad perspective and deep understanding of human spirituality that won huge audiences for A History of God, Armstrong illuminates the spread of militant piety as a phenomenon peculiar to our moment in history. To ask other readers questions about The Battle for God, please sign up. please tell me how i read the book in the site? For the last decade or so, most of us have had to form some kind of opinion on religious fundamentalism, and it's a subject which can very easily become hysterical, sensational or just terrifying when it's addressed by the mass media. This exceptional book, which came out a few years ago now, is a careful examination of fundamentalism in Islam, Christianity and Judaism, and it tries to answer the basic questions many people feel – who the hell are these people, and how can they believe what they For the last decade or so, most of us have had to form some kind of opinion on religious fundamentalism, and it's a subject which can very easily become hysterical, sensational or just terrifying when it's addressed by the mass media. This exceptional book, which came out a few years ago now, is a careful examination of fundamentalism in Islam, Christianity and Judaism, and it tries to answer the basic questions many people feel – who the hell are these people, and how can they believe what they believe? As a jumping-off point, Armstrong points to an ancient distinction between two forms of truth (as described by the Greeks): mythos and logos. Logos is scientific, rational truth which has allowed us to build cars and bridges and visit other planets. Mythos is a different kind of truth, found in myth, art, and in the beliefs of religion. The central theme of her book is that fundamentalism is essentially the result of confusing one kind of truth with another. As she demonstrates, pre-modern peoples saw religion as belonging firmly to the realm of mythos. Religion was concerned with stories and concepts not to be taken literally, but used as ways to consider the nature of humanity, our relationship to the spiritual, and our place in the world. Logos is useful for science and politics, but it cannot answer the big questions of existence: that is the job of mythos, and the two realms of truth were kept very separate until a few hundred years ago. But after the Enlightenment, when rationalism became so effective and so much a part of life, there was a gradual change of mood, and an increased sense that scientific truth was more important than spiritual or mythic truths. Mythos became sidelined and subsequently discredited as ‘only’ a myth. It was, Armstrong argues, in reaction to this mentality that some religious groups, feeling threatened, attempted to reinterpret mythos as logos, taking religious concepts as being literally true, and using them as a basis for legislation and political life. Using this distinction between scientific and spiritual truths makes for an interesting reexamination of historical issues: the Reformation, for instance, becomes a clash between idea systems. In the pre-modern Catholic church, the Eucharist was a rich spiritual symbol of human participation in the divine. But for the rational Reformers, it must either be literally true (Luther), or else plain false (Zwingli, Calvin). They were unable to see beyond scientific truth. Similarly, for many Orthodox Jews in the 1930s and '40s, the idea of a modern State of Israel was deeply abhorrent. For them, Israel was a profound symbol of their religion, a vital part of Jewish spirituality to be contemplated – not a place to make a farm and start tilling sacred soil. When many of the ultra-Orthodox considered a kibbutz, Armstrong writes, they ‘felt the same outrage and dread as, later, people felt when the heard about the Nazi death camps.’ She adds, ‘This is not an exaggeration,’ and cites Jewish clerics who actually blamed the Holocaust on the settlement of Israel. By pointing to such fundamental differences of opinion, Armstrong shows that most contemporary fundamentalist movements are in fact decidedly modern, despite the fact that they all profess a wish to go ‘back to basics’. The literalism which is seen in fundamentalism is a concept which is really only a few centuries old. She is particularly strong when it comes to Islam, pointing out that while Western Europe had three or four hundreds years to adjust to modern rationalism, most Islamic countries had such ideas foisted on them more or less overnight by colonial powers (generally Britain, France, Russia and later the US). It is difficult for most of us to understand, for example, why terrorists seem to hate democracy, but she points out that the Islamic experience of democracy has been very different from ours – imposed on a country in one fell swoop, and usually resulting in a lot of business contracts for foreign companies, and a lot of money for those in power but little for anyone else. Her case studies of Egypt and Iran make this point beyond doubt, and show the importance of making a place for religion in society, to prevent it from becoming sidelined and hence feeling threatened. If you're from the UK or the States, the book is not comfortable reading, since most of the problems in the Middle East are traced squarely back to Western interference, and in some cases the details are heartbreaking. In particular, America's complete failure to understand Islamic societies throws a lot of light on the Iranian Revolution as well as the rise in reactionary groups, and reading this won't make you feel too hopeful about Iraq's or Afghanistan's chances, let alone the way Iran itself is currently being dealt with. But this is far from being an exclusively Islamic problem; rather, the book shows that fundamentalism is just a reaction to the secularism of modern life, a frightened response to the ‘God-shaped hole’ which Sartre talked about, or Nietzsche's ‘God is dead’. We have lost an appreciation of mythos in the West – though many people feel the lack of it, which may explain the popularity of such things as tarot cards, dream dictionaries and psychoanalysis. In that sense, this book, while clearly condemning the abuses of fundamentalism, is equally unimpressed by modern secularism. ‘If fundamentalists must evolve a more compassionate assessment of their enemies in order to be true to their religious traditions,’ she writes, ‘secularists must also be more faithful to the benevolence, tolerance and respect for humanity which characterizes modern culture at its best, and address themselves more empathetically to the fears, anxieties and needs which so many of their fundamentalist nieghbours experience’. These movements do not represent a knee-jerk reaction, but a considered response to modernity, and unless we try and understand that, the problems will not go away. My goal is to formulate a gospel of atheism which is so full of loving-kindness that all the Christians and everyone else too, why not be ambitious, will join me and their migraines caused by their impossible theology will cease, their gnarled hearts caused by their doctrinal disagreeablenesses will unclench and we can all form a circle of lambent fulfilledness which will wink and pulse gently like tacky Christmas tree lights as we bask in the suddenly clear and perfect knowledge of the absolute My goal is to formulate a gospel of atheism which is so full of loving-kindness that all the Christians and everyone else too, why not be ambitious, will join me and their migraines caused by their impossible theology will cease, their gnarled hearts caused by their doctrinal disagreeablenesses will unclench and we can all form a circle of lambent fulfilledness which will wink and pulse gently like tacky Christmas tree lights as we bask in the suddenly clear and perfect knowledge of the absolute remarkableness of being here at all, that's all, just being here on a strange planet being able to breathe, and that's it, no heaven, no hell, no fees, no guru, no method, no teaching, no mantra, nothing special, just that. An examination of religious fundamentalism is an arduous undertaking for any reader, and not simply because it necessitates immersion into a different cultural perspective. The sheer voltage of psychic violence brandished by some of these sects injects the issue with a heavy dose of repellence. That's the irony, of course. Making atrocity your weapon of choice will, yes, absolutely garner worldwide attention. You will be seen as you have hungered to be seen. Does it matter that this will frequen An examination of religious fundamentalism is an arduous undertaking for any reader, and not simply because it necessitates immersion into a different cultural perspective. The sheer voltage of psychic violence brandished by some of these sects injects the issue with a heavy dose of repellence. That's the irony, of course. Making atrocity your weapon of choice will, yes, absolutely garner worldwide attention. You will be seen as you have hungered to be seen. Does it matter that this will frequently occur through the crosshairs of a rifle scope? And there is a taste of the journey, as a reader and a thinker, through the terrain most recently inhabited by Al Qaeda and ISIS. Terrorism is designed to terrorize and all the images we possess - whether they be of the corpse of a serviceman dragged through foreign streets, a passenger jet slamming into the World Trade Center, or a journalist's beheading - will rise to mind to tap that terror on the road to developing an understanding of this element of society as it operates today. This issue is highly-charged for me, and so it becomes critically important that I choose my authors with care. It's easy enough at present to fall into the hands of cynics and rabble-rousers; the scornful academic, the conspiracy theorist, the tabloid instigator; anyone with a motive that departs, modestly or monumentally, from simple comprehension. Because that's what I'm here to do: comprehend. What I do with that comprehension comes later, for now it's understanding I require and there are few better suited to provide it on this particular subject than Karen Armstrong. This work has depth, intelligence, relevance, and is blissfully readable. She manages to synthesize a vast amount of intricate religious history into solid, well-constructed avenues of approach - and that is no mean feat. In The Battle for God, Armstrong explores the impact of modernity on the deeply religious, especially those for whom the advent of rational, scientifically-oriented thought has elicited a fear of annihilation. She tracks the course of movements in Egypt, Iran, Israel and America to maintain traditional faith in the face of the new pragmatism and the evolving insistence that what is true is only what can be empirically proven (which leaves the bedrock of most religions in the dust). She calls attention to the tendency of those who feel attacked by the modern age to retreat and isolate in their attempt to preserve their way of belief. Such isolation, fostered as it is by fear, rage and a sense of persecution, can scar the soul of a movement and bring about paranoia, desperation, thoughts of rebellion and strategies of violent retribution - which are inevitably directly opposed to the tenets such faiths hold dear. Logos and mythos, Armstrong asserts, are best when balanced. Each needs the other if the human psyche is to thrive. For while it is true that the religious need to adapt to the changing nature of civilization, it is also true that the modern world needs to recognize the vital role the spiritual holds in helping to keep the meaning (of life, struggle, suffering) in play. As she plainly points out: "Rational thought has achieved astonishing success in the practical sphere, but it cannot assuage our sorrow." For those with an interest in examining the forces behind the religious extremism we are encountering today, make a note of this author and take a look at this book. An exceptional source for an exceptional time. If I could, I would give Armstrong's book 3 stars because it *is* an excellent source of information dealing with fundamentalist-like religious sects from Columbus' time and on. Armstrong writes eloquently and her material is well-organized and easy to understand. If I could, I would give Armstrong's book 3½ stars because it *is* an excellent source of information dealing with fundamentalist-like religious sects from Columbus' time and on. Armstrong writes eloquently and her material is well-organized and easy to understand. However, in an attempt to explain the fundamentalist mindset, Armstrong argues that "people of the past... evolved two ways of thinking, and acquiring knowledge... mythos and logos". She describes mythos as "concerned with what was thought to be timeless and constant in our existence... [concerned] with meaning... [and with] the origins of life" (p. xv). Logos, then, supposedly "was the rational, pragmatic, and scientific thought that enabled [people] to function well in the world" (p. xvi). The modern West, she contends, has lost mythos, preferring a future-oriented world view (logos) that prioritizes factuality and rationality. Armstrong thus constructs a happy little world in the past where both logos and mythos balanced each other perfectly (cf. p. xvii), setting up the argument that fundamentalism today is a response to the contemporary lack of mythos. Unfortunately, such a balanced world simply did not exist, and her premise is consequently undermined. For example, on p. 95, Armstrong laments the Higher Criticism assessment of the Bible as "the triumph of the rational discourse of logos over myth". By this time, she writes, "Western people had lost the original sense of the mythical, and thought that doctrines and scriptural narratives were logoi, narratives that purported to be factually accurate..."
Excuse me, but what Bible is Armstrong using? My Bible certainly `purports' its narratives actually did happen, or that at least the writers believed so (not that I agree). Luke claims he wrote his account "after investigating everything carefully from the very first" (Lk. 1:3, NRSV). John includes the "testimonials" of a few people who swear to the factuality of the events they are recounting (cf. Jn. 19:35; 20:30-31; 21:24-25). Paul leans on the literal resurrection of Jesus to support his teachings (1 Cor. 15:14). The Old Testament cites now-lost books as if to further substantiate its account of Israel's history (cf. Josh. 10:13; 2 Sam. 1:18). Thus, the narratives Armstrong considers "mythoi" are affirmed by their own authors as something strikingly more akin to her definition of logos. And note that the New Testament writers looked *forward* to the literal Second Coming of Jesus, clearly more in the spirit of logos. In fact, many of them broke with tradition (the past), believing something new had come and would return. Another example: Armstrong portrays the Passover Seder as a mythos meant to help Jews experience the Exodus myth and "[bring] this strange story into their own lives... to make it their own" (p. xvi). She asserts that "[t]o ask whether the Exodus from Egypt took place exactly as recounted in the Bible or to demand historical and scientific evidence to prove that it is factually true is to mistake the nature and purpose of this story." Oh, is it now? A cursory reading of the Haggadah reveals how its authors intended the Seder to be a commemoration of an event which they believed occurred, not in mythical "timeless realities", but in actual history. Many other texts could be used to demonstrate how the neatly divided realms of mythos and logos did not exist. The Nicene Creed, for example, does not present a Jesus who was crucified in the eternal world of mythic truth, since its sources do not do so either. But I trust that I've made my point. حسناً.. لم يكن كتاباً سيئاً على كل حال.. ولم يكن جيداً أيضاً. أشعر بالحياد التقييمي إزاء تلك السردية من كارن أرمسترونج التي لم تفعل فيها أي شيء غير سرد التاريخ والأحداث حدثاً يلي الآخرَ. كنت أتمنى أن أتلقى صدمةً معرفية إثر تلقّي جرعة معلوماتية ضخمة بيد أنني قد تلقيتها لكنّي أشعر نحو ما تلقيتُه باللاطمأنينة بعد أن تعرضت إلى مجموعة من المعلومات التي وجدتها غير مدققة بما فيه الكفاية ما أصابني بالإحباط والتبسني الشك إزاء كل ما يُقال في الكتاب. لا أعلم لماذا أشعر بأن كارن أرمسترونج تحيطها هالة مزيفة من حسناً.. لم يكن كتاباً سيئاً على كل حال.. ولم يكن جيداً أيضاً. لو كانت اكتفت الكاتبة بتناول الجانبين المسيحي واليهودي في الصراع من أجل الإله لكان ذلك أفضل من تناول الجانب الإسلامي، لا كُرها مني لنقد الجانب الإسلامي والبحث في الجوانب التاريخية لظاهرة الأصولية فيه بل لظهور بعض النقاط التي بدت فيها الكاتبة على غير اطلاع كاف.. يشكر لها جهدها رغم ذلك وأطرح ههنا سؤالاً: لماذا لا نقوم بمحاولة البحث والتنقيب في أصول ظاهراتنا نحن بدلاً من تناول تحليلات المفكرين الغربيين؟"
الكتاب على طوله لم يكن منظّما ًكفايةً مما أدّى إلى تشتيتي طوال تلك الرحلة الطويلة وأفقدني كثيراً من حماس العودة إليه سريعاً بعد انتهائي من قراءة قدر منه. لكنّي ورغم ما سبق ذكره آنفاً قد تكشّفت لي بعض الأمور فيما يخص الأصولية في الأديان الثلاثة وتشابهها المنهجيّ الكبير على الرغم من فروقات العقيدة بينها وأنّ الخوف المرضي من الحداثة والانمحاء التام كان سبباً كبيراً من ضمن الكثير في نشأة تلك الحركات. نصيحة، يمكنك القفز إلى خاتمة الكتاب لاستخلاص الفائدة في أقلّ وقت. Are you confused by all the religious groups in the news? Fundamentalists, Pentecostals, Haredim, Shii, Sunni, Lubavitcher, Satmar, Wahhabis, the Muslim Brotherhood? Are you also confused by the demands of religious fundamentalists? They rant and rave and call for destruction of what seems to many Americans innocuous. Is it pure malice or something else? If you can identify with this confusion, this is the book for you! Not only is it easy to read while at the same time filled with satisfying deta Are you confused by all the religious groups in the news? Fundamentalists, Pentecostals, Haredim, Shii, Sunni, Lubavitcher, Satmar, Wahhabis, the Muslim Brotherhood? If you can identify with this confusion, this is the book for you! Not only is it easy to read while at the same time filled with satisfying detail, it is also three books in one, tying together the strands of Muslim, Jewish and Christian fundamentalism to show that they are all reacting to modernity in remarkably similar fashion. I've grown to appreciate Karen Armstrong from her book on Islam and her autobiography of her time in a convent, Through the Narrow Gate. She is a reliable guide through the labyrinthine world of religion, a master of pulling the underlying psychological motivation from mysterious practices. While keeping the three religious traditions distinct, yet transitioning from one to another at appropriate points where similar forces were at work upon them, Armstrong moves through history showing how each fundamentalist movement came to be in reaction to social upheaval, often almost simultaneously. I found myself repeatedly thinking, "so THAT'S where that group started!" You will hear about rabbinical thinking from the Jewish ghettos of Poland, of the high regard Iranians place on the Hidden Imam. Why was Egypt's Nasser important to the formation of the Muslim Brotherhood? Armstrong powerfully illuminates what for most Americans is obscure history from other lands, yet fills us in on the history of American fundamentalism as well. Jerry Falwell, Jim and Tammy Bakker, the Scopes monkey trial, they're here as well. This is an epic work that flows. Armstrong's thesis is simple: being human, we need both myth (mythos) and reason (logos). While it is possible to live with only logos, to get there is not easy, not coming naturally to human beings with our psychology that all but cries out for a foundation for emotional stability. The great error is to think that mythos can be adapted to logos - that the spiritual can be explained on a rational basis, that the numinous can be made concrete. Yet reason/logos has taken the scene with overwhelming and undeniable practical success. So conclusive is this victory of logos, that mythos, to be credible to the modern mind, must be made to answer on the terms of reason - yet by its nature, it cannot. In the desperate attempt to make religion live under a scientific worldview, fundamentalism makes its appearance to rage and rant in defense of mythos on the field of logos; a project that is inevitably futile. As Armstrong explains, the coexistence of mythos and logos came naturally in the ancient world where people looked to myth for explanation and found emotional security in communicating with the spiritual, represented in religious practices of long standing. The world went on century upon century without the expectation of progress that is an essential part of modernity. Nothing was novel, all was explicable through spiritual interpretation, the will of god or the gods. St. Augustine is known for his appeal to stifle all curiosity and put faith in God. Modern secular societies look only forward in expectation of material things to come, as tradition, mythology and spirituality fall away, useless superstitions, a weakness of the credulous. Prove it or cast it off. Thus is the mythos/logos cohabitation destroyed and so arise the psychological anxieties and fears that mythos kept in check by providing answers satisfyingly endorsed by the wisdom of elders back to time immemorial. But whether it is the "back to the Bible" appeal or bin Laden's praise for the practices of the time of Mohammed, there is no going back. Karen Armstrong would like us to ease forward with understanding rather than blind suppression. This book is a plea for understanding of the fear that drives the desperation of fundamentalism. It is not a call for the overthrow of reason or the elevation of religion, nor an apologia for religious extremism. The Battle for God is a monumental work that fills in many of the gaps in our modern,streamlined educational system,because it is a heroic attempt to articulate all sides of the conflict between spiritual impulse and reason,tradition and progress. This approach allows Armstrong to delve far deeper than the dry 'facts' which are pretty much all I was given, so that she manages to acheive a much broader perspective than the usual polemical or reductionist style. Beginning in the pivotal year 1492, The Battle for God is a monumental work that fills in many of the gaps in our modern,streamlined educational system,because it is a heroic attempt to articulate all sides of the conflict between spiritual impulse and reason,tradition and progress. This approach allows Armstrong to delve far deeper than the dry 'facts' which are pretty much all I was given, so that she manages to acheive a much broader perspective than the usual polemical or reductionist style. Beginning in the pivotal year 1492, Armstrong traces the various threads that unravelled from that peak year in the history of the 3 great monotheisms,to give us a better insight into the nature of fundamentalism and its alarming manifestations in our secular world. Personally, I wish she would have started earlier,quite a bit earlier,but I can appreciate the nightmare of reasearch and editing the overwhelming amount of material surrounding the topic. Still. I would have liked to know more about the golden age of Al-Andulus when all 3 variations of monotheism flourished together,in an unprecedented and never again acheived harmony. In fact, this book awakened in me a ferocious passion to find out more about everything that Armstrong so deftly skims over to give us this remarkable overview.That in itself is a major acheivement. It occurs to me that conventional education consists of a merry-go-round approach,with a fixed point of view and a limited scope. Armstrong takes us on a roller coaster ride,soaring above the horizon,dipping deep,then rising again to to glimpse unforseen connections with the larger surround. Surely it's unreasonable of me to be left wanting more,such as a roller coaster that moved in slo-mo? This is not a real criticism of the book,more like the opposite,but it seems to me that equally thick books could be written about almost every single paragraph in this one. Armstrong has given us a vivid and important work,condensing a formidable amount of material without trivializing or patronizing. If at times I was left feeling dizzy, or that crucial facts were being glossed over, surely its up to me, the reader to search out additional details, the backstory of the backstories she so deftly outlines. Perhaps because of the inadaquacy of the rating system,perhaps more because of my own personal bias,perhaps I need to read it again. And perhaps I am wrong, but sometimes,it seemed to me, her impartiality slips, and I detected in her a maddening tendency to accept the premise that modernity is progress,is inevitable, and that those of us who remain skeptical of its intrinsic value are hopelessly clinging to an unworkable program. Certainly she smashes some of our most pervasive stereotypes,but I was disturbed by the few she retains,mainly, the portrait of the dim witted peasant,attached to an anscestral piece of land,without the so called benefits of modern technology, which,we are seeing, have often been ultimately harmful,resulting in a toxic,depleted environment. When she scoffs a bit at the unsophistication of of traditional ways, I wonder about the value of sophistication that is so out of harmony with the seasons and so incongruent with the cosmic rhythms that it seems acceptable to need a pill to wake up in the morning and a pill to go to sleep. Even more disturbing to me is her assumption that ultimately,we all need to "get with the program". I found no place for myself in any of her catagorizations, for though,like the traditionalists she depicts I detest the hypocracy underlying much of what is seen as expediant and acceptable and modern,and refuse to jump on the latest bandwagon,I am no fundamentalist reactionary. Indeed, I am more of a pagan than a true believer,prefering to celebrate diversity rather than striving for unity.In any repressive regime,likely I'd be a cantidate for the stake. This book is classic Armstrong. The Battle For God describes the aspects of the histories of the three great monotheisms (Judaism, Christianity, and Islam) which led to the rise of modern fundamentalism in all three. In the process, she explores some of the commonalities of these different fundamentalisms and their origins. This book is jam packed with information, so I will not try to cover any of the specific. Instead, I will focus on the high level themes. In Armstrong's view, fundamentalisms a This book is classic Armstrong. In Armstrong's view, fundamentalisms arise as a result of the process of modernization and are themselves deeply modern movements. By the process of modernization she means, roughly, the transformation from mostly agrarian societies with a focus on the past and present to societies whose success is based and innovation and whose members are future oriented. This future orientation causes a focus on the rational and a discounting of the mythological. Armstrong claims that in pre-modern times, these two modes of reasoning were seen as complementary, not competitive. In modern times, mythological truth is seen as an oxymoron. Myth is seen as story and lie. Armstrong defines mythological truth implicitly rather than ever coming out and saying what it is. She seems to see mythological truth as having two components: it cannot be proven rationally and its purpose is to give meaning rather than to be right. One of the commonalities of different fundamentalism is that they try to make mythological truths into rational truths which causes damage both to the religion itself and the world they try to apply their literalized truths to. One of Armstrong's central theses is that fundamentalism is essentially a modern response to the changing world. Fundamentalists generally try to turn their mythological truths into logical truths. As such, the fundamentalist vision of a religion is no more authentic than the world they are rebelling against. However, the fundamentalist vision is structured so that the adherents to the vision think it is more authentic. The modernization process began as scientists like Copernicus showed that our intuitions and perceptions do not map cleanly onto the truth of reality. In fact, sometimes or intuitions and perceptions can be downright misleading. Fundamentalist ideologies, whether religious or not, often are rebelling against this complexity of reality. They try to push a simplified version of reality onto their adherents and, sometimes, onto others. But the rise of fundamentalism is not related solely to changes in our views of the world and its abstractions. Fundamentalism often arises because of specific historic events. It is undeniable that the modernization process has often been harsh. The raising up of people in the lower ranks of society has often led to a demand for more uniformity. The "other" has always been perceived as a threat, but when that fear of the other is combined with the increasing power of modern states, the results can be disastrous. Because of this, much of The Battle for God reads like an extended lesson in the history of Europe, the Middle East, and the US from the 15th century through the present. As someone who is not a history buff (and, therefore, whose view of history is strongly influenced by the western bias of history lessons in the American education system), I learned a lot. I pretty much knew nothing about most of the history of the Middle East. Now I know a little! While her view was certainly biased (even if you ignore the bias that all authors bring to the table, she was only interested in those events which related to the topic of religious fundamentalism), it is still impossible for someone like me to come away with this without having some seriously altered views. Probably the most fundamental change in view that I got from the history Armstrong presented had to do with my perception of the attitudes of Muslims to the west. While I knew at an abstract level that the west had not been good to the Middle East, I had not realized what a rational basis their hatred has. The west has screwed over that region again and again and again. Now, I don't think that the fact that the hatred has a rational basis means the hatred itself is rational, but if I had been treated like they were, I would also likely perceive the west as evil. Made a couple of minor changes: Rarely does one come across a book that is recognized as erudite, essential, and readable simultaneously. The author of The History of God has brilliantly analyzed the rise of fundamentalism as a reaction to the emphasis on logos of the Enlightenment as opposed to mythos that had been essential to one's view of the world. "The economic changes over the last four hundred years have been accompanied by immense social, political, and intellectual revolutions, with th Made a couple of minor changes: Rarely does one come across a book that is recognized as erudite, essential, and readable simultaneously. The author of The History of God has brilliantly analyzed the rise of fundamentalism as a reaction to the emphasis on logos of the Enlightenment as opposed to mythos that had been essential to one's view of the world. "The economic changes over the last four hundred years have been accompanied by immense social, political, and intellectual revolutions, with the development of an entirely different, scientific and rational, concept of the nature of truth; and once again, a radical religious change has become necessary." As science and technology began to become associated with such visible successes in overcoming disease and social ills, the tendency was to believe that logos (rational, scientific thinking related exactly to facts and external realities) was the only “means to truth and began to discount mythos [that which is timeless and constant, “looking back to the origins of life . . to the deepest levels of the human mind . . . unconcerned with practical matters” and rooted in the unconscious, that which helps us through the day, mythological stories not intended to be literal, but conveying truth:] as false and superstitious.” The temptation is to think of mythos as meaning myth. In this context that would be incorrect. Armstrong uses this word as it relates to mystery and mysticism, rooted ultimately in traditional biblical and Islamic history “which gives meaning to life, but cannot be explained in rational terms.”Logos, however, was unable to assuage pain and suffering leading to a vacuum the fundamentalists sought to revive. The danger unseen by modern fundamentalists is that they have tried to imbue mythos with an element of literalism essential to logos. The difference between these two concepts forms the basis for the battle between modernism and fundamentalism. Armstrong traces the beginning of the fundamentalist movement back to the time of Columbus when a crisis occurred in Spain. Ferdinand and Isabella expelled both Muslims and Jews from Spain. The three religious groups had actually coexisted quite happily and profitably together for several centuries, but the prospect of modernity and threats from a new world view, science, threatened age-old traditions and myths. The fundamentalist movement was an attempt by traditionalists to retain a sectarian view of the world. e faithful. Often an arrogance and condescension – I plead guilty here – make secularists insensitive to those who feel their religious beliefs have been undermined and challenged. The seemingly irreconcilable difference between rationalism and mysticism perhaps make militant fundamentalism inevitable. The danger for fundamentalist lies in their attempts to turn mythos into logos, e.g., have sacred texts be read literally and inerrantly as one would read a scientific text. That may lead to inevitable discrepancies between observation and belief that may hasten the defeat of religion. Of great benefit, is Armstrong's clear explanation of the differences and conflicts that exist in Islam. Shiite and Sunni branches represent very different interpretations of a major faith. کتابی خوب برای آشنا شدن با ریشه های بنیادگرایی در هر سه دین توحیدی. I gave this book five stars because it was a great, fascinating read and it really helped me understand some things. However I do think this is just the beginning for me, not so much as far as understanding the nature of fundamentalism, but how to deal with the realities of it. 1). Fundamentalism is inherently modern--it's a reaction to the secular thrust of modernity. In the premodern era people did not separate the spiritual from the physical--there was real I gave this book five stars because it was a great, fascinating read and it really helped me understand some things. However I do think this is just the beginning for me, not so much as far as understanding the nature of fundamentalism, but how to deal with the realities of it. In the premodern era people did not separate the spiritual from the physical--there was really no concept of religion in the sense we speak of it now. Science was "natural philosophy" and was intimately entwined with the idea of a divine creation. It wasn't until after the enlightenment when people began to look at their sacred texts and try to make them fit into the new world view which was based on empiricism. First there was the world and it was whole. Then it was split in two (into the reality-based and the unseen) and people were being told only half really counts. This created a conflict. 2). It is born of fear. Specifically the fear of annihilation. As a huge part of people's identity is stripped away, they experience it as a trauma. Much the way global capitalism threatens people's cultural identity, having their religion declared meaningless was threatening. 3). The fear is well-founded, especially in regards to Judaic and Muslim fundamentalism. It's very important to understand that there are huge populations of people who gained none of the benefits of modernism and in fact experienced it's arrival in their society as an extremely violent occurrence. In many middle eastern countries like Turkey, Iran and Egypt, the enlightenment was a foreign encroachment that made an elite very wealthy while the peasant class was left behind economically. When religious leaders tried to lead protests for the rights of these people they were often cruelly suppressed. I think the explanation for the rise of fundamentalism in the US is not quite as well argued, although reading this book did inspire some thoughts and more understanding of where it comes from--quite different from the middle eastern and Jewish fundamentalism. If I had to sum up fundamentalism in one word it would be fear. Fear leading to retrenchment and seclusion, and then to paranoia, and then to offensive action. Once you know the symptoms you start to see it everywhere--even on the left end of the spectrum. For example with a certain contingent of so-called "militant atheists", I believe this is the flip side of the coin. They seem to view religion in general as a vast conspiracy plotting to take away their hard-won freedom. To a degree they are right, but the desire to expunge religion from the world to make secularism safe is in a way very similar to fundamentalists wanting to re-sacralize the world and rid it of the tyranny of materialism. And they are also right to a degree. This is where I would like some answers on how to proceed. Is it possible to assuage fears on both sides and heal the rift? I do hope so. 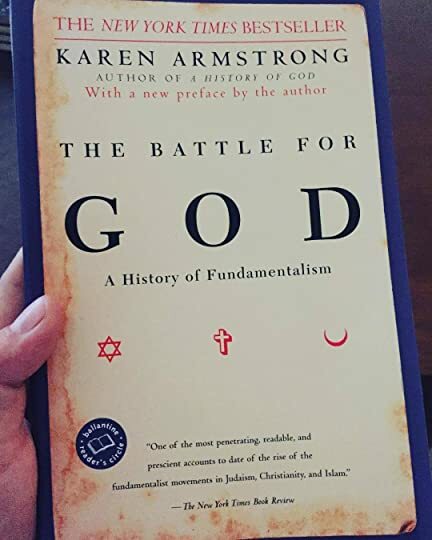 I had had my eye on "The Battle for God: A History of Fundamentalism" by Karen Armstrong, for some time, as I admire Armstrong and have always scratched my head at fundamentalism, i.e., how could anyone fall for that stuff (the classic response from a liberal Christian)? So I read the book at last--and found it an absolutely fascinating, impeccably researched, and well-written volume for anyone else who might scratch their head about fundamentalism, or who might wonder 1) what Christian, Jewish, I had had my eye on "The Battle for God: A History of Fundamentalism" by Karen Armstrong, for some time, as I admire Armstrong and have always scratched my head at fundamentalism, i.e., how could anyone fall for that stuff (the classic response from a liberal Christian)? So I read the book at last--and found it an absolutely fascinating, impeccably researched, and well-written volume for anyone else who might scratch their head about fundamentalism, or who might wonder 1) what Christian, Jewish, and Muslim fundamentalists might have in common; and 2), what are the forces that produce funadmentalism? It's quite intriguing--Armstrong demonstrates the similar traits of fundamentalism, not only across the three religions, but across countries that vary widely in their economic and political development (the U.S. and Israel on one hand, Iran and Egypt on the other). Another excellent and eye-opening book by Armstrong. She discusses the impact of scientific and enlightenment philosophies that have moved away from or completely rejected traditional religions, and the growth of fundamentalist movements as a modern reaction to the increasingly secular world. Fascinating to read, even for the nonreligious. This is one of the best books on religion I've ever read. Armstrong is insightful, respectful, and articulate. She really changed my view of religious fundamentalism in many respects. I highly recommend this book. الكتاب يقدم عرض تاريخي لصعود الأصوليات في الأديان الابراهيمة الثلاثة منذ عام 1492، وهو عام اكتشاف أمريكا واستعادة الأسبان لأخر المدن الأسبانية من أيدي العرب المسلمين. وترى الكاتبة أن السبب الرئيسي لصعود الأصوليات هو عنف الحداثة في مواجهة الدين وطغيان منطق العقل بطريقة تكاد تكون عدوانية على منطق الروح، جعل بعض أتباع الديانات يستشعرون الخطر على الدين وعلى وجودهم، فقاموا بحركة مقاومة تمثلت في الأصولية التى رفضت منطق العقل تماما وكل قيم الحداثة. وترى الكاتبة أن الأصوليات الثلاثة بدأت تقع في نفس الما الكتاب يقدم عرض تاريخي لصعود الأصوليات في الأديان الابراهيمة الثلاثة منذ عام 1492، وهو عام اكتشاف أمريكا واستعادة الأسبان لأخر المدن الأسبانية من أيدي العرب المسلمين. وترى الكاتبة أن السبب الرئيسي لصعود الأصوليات هو عنف الحداثة في مواجهة الدين وطغيان منطق العقل بطريقة تكاد تكون عدوانية على منطق الروح، جعل بعض أتباع الديانات يستشعرون الخطر على الدين وعلى وجودهم، فقاموا بحركة مقاومة تمثلت في الأصولية التى رفضت منطق العقل تماما وكل قيم الحداثة. وترى الكاتبة أن الأصوليات الثلاثة بدأت تقع في نفس المازق عندما وصلت للسلطة حيث عملت على أدلجة اساطير وخرافات الأديان ومحاولة تطبيقها على ارض الواقع فبأت بالفشل وبدات في الإنهزام. لذلك ترى الكاتبة، ضرورة الموازنة بين منطق العقل ومنطق الروح، وأن يعود كل منهم الى موقعة دون محاولة السيطرة على مناطق عمل الطرف الأخر. In The Battle for God, Karen Armstrong traces the history of fundamentalism in the three monotheistic religions, i.e. Judaism, Christianity, and Islam. The author explains fundamentalism to be a modern phenomenon, which could only take place in our modern times. It is only in the post twenty century world that religion has been sent into the aisles while the values of liberalism control all aspects of human life. It is this attitude towards religion which allows the fundamentalist zeal to grow o In The Battle for God, Karen Armstrong traces the history of fundamentalism in the three monotheistic religions, i.e. Judaism, Christianity, and Islam. The author explains fundamentalism to be a modern phenomenon, which could only take place in our modern times. It is only in the post twenty century world that religion has been sent into the aisles while the values of liberalism control all aspects of human life. It is this attitude towards religion which allows the fundamentalist zeal to grow out of bounds. Fundamentalists consider themselves as the last saviours of religion; they have a mission to bring back religion from the aisles to the centre of our modern society. Karen Armstrong gives a detailed account of different fundamentalist tendencies in the three faiths. She analyses the Heredims in Judaism, Protestant premillennialism in Christianity, and Syed Qutb's and Khomini's revolutions in Islam. All these movements have transformed religious mythos into logos. In the pre-modern world, myths were never meant to be considered form a rational point of view. The inherent enigma present inside the mythos allowed people to connect with the divine. The logos, the practical aspects of religion, was always complemented these mythos. Therefore, a perfect balance between mythos and 'the practical' was always present. This balance was completely destroyed after the rise of scientific modern world. This new world was based on tangible and empirical evidences, with no room for mythos. Everything that was logo was open for a critical examination. As the fundamentalist cannot disregard mythos, they have tried to transform their respective religious mythos into concrete ideological logos. Be it the theory of Zionism, the idea of rapture, or the institution of Vilayat-e-Faqi. On the basic level, it is the transformation of mythos that has provided the much need energy to drive fundamentalism in the modern world. Secondly, in today's world, Nihilism has become a basic ingredient of fundamentalist movements. They have created suicide bombers, excommunicated people who criticise their ideologies, and have put their back towards the modern world. It is these nihilistic tendencies which drives Jewish fundamentalist to plan an attack on the Dome of Rocks and Muslim fundamentalists, such as Taliban, to kill innocent men and women in the name of God. Nihilism has become an integral part of their program. Meanwhile, the book also maintains that fundamentalism is primarily a modern movement. It is a reaction to the ethos of the modern world. In this respect, fundamentalism isn't an inherently religious movement. It has originated due to the internal dialectics of modern societies. Hence, it is the scientific drive which has led Christians and Muslims alike to test their sacred scriptures on the touchstone of modern science. Moreover, the alienation created as a result of the total neglect of mythos has clearly distorted our subconscious self. Humans always need mythos as much as they need logos. This alienation has created, in the words of Sartre, a "God-shaped hole" that needs to be filled up. Fundamentalism tries to fill this alienation problem, but mostly it is unsuccessful in performing this task. The author has done an excellent job in trying to explain the fundamentalist's view point from their own perspective. Without understanding their believe structure, it is quite impossible to dialogue with them. Dealing with a fundamentalist is like dealing with an anachronistic person. A modernist and a fundamentalist can never understand each other points of view, because they don't exist on the same plane of thought. The book prophetically claims hat fundamentalism is here to stay. Liberalism hasn't been able to solve all human problems on the basis of rationality. Fundamentalists of the three faiths will always exploit this fact for their personal agendas. في هذا الكتاب تحاول كارين أرمسترونج البحث عن ظاهرة الأصولية وما وراءها والصراع الذي يصاحبها وإلى أين تتجه في الديانات الثلاثة الرئيسية. معتبرة أنها كالسرطان الذي ينخر جسد جوهر الديانات ورسالاتها السماوية، محذرة من استخدام النص المقدس كبرنامج سياسي ثقافي حسب مفسري الأديان لأن ذلك يقود إلى دمار المجتمعات. تعتبر أرمسترونج أن الأصوليات المتطرفة تتشاطر قواسم مشتركة، فلم يكن لدي الأصوليين وقت للديمقراطية أو التعددية الحزبية، أو التسامح الديني أو الحفاظ على السلام أو الخطاب الحر، أو فصل الدين عن الدولة، في هذا الكتاب تحاول كارين أرمسترونج البحث عن ظاهرة الأصولية وما وراءها والصراع الذي يصاحبها وإلى أين تتجه في الديانات الثلاثة الرئيسية‏. معتبرة أنها كالسرطان الذي ينخر جسد جوهر الديانات ورسالاتها السماوية، محذرة من استخدام النص المقدس كبرنامج سياسي ثقافي حسب مفسري الأديان لأن ذلك يقود إلى دمار المجتمعات. تعتبر أرمسترونج أن الأصوليات المتطرفة تتشاطر قواسم مشتركة، فلم يكن لدي الأصوليين وقت للديمقراطية أو التعددية الحزبية، أو التسامح الديني أو الحفاظ على السلام أو الخطاب الحر، أو فصل الدين عن الدولة، لكنهم يميلون إلى الانخراط في نمط واحد وهو الصراع مع الآخر الذي يعدونه حربا كونية بين قوي الخير والشر. وهؤلاء يستمدون أفكارهم من بعض النظريات الماضية ويقيمون لأنفسهم ثقافة خاصة مغلقة مضادة للثقافة السائدة في المجتمع الذي ينسحبون منه ولا يشعرون بالانتماء إليه. ولكي يحققوا أهدافهم المرضية يلجؤون إلى العنف المسلح وإراقة الدماء والهدم والتدمير ومن ثم يصبح المجتمع بالنسبة لهم كافرا ينبغي الخروج عليه وإعلان الجهاد ضده، لذا فكل الأصوليات تحارب وتقتل باسم الدين، بل وتكافح حتى تدخل المقدس إلى عالم السياسة والنضال الوطني. وهذه الأصولية ما قامت إلا دفاعا عن أقدس القيم التي تؤمن بها والتي تعرضت للنزعات العدوانية من جانب قيادات الحداثة، وتعترف بأن المفكرين الذين استمتعوا بثمرات الحداثة ومنجزاتها - وهي منهم ـ يتعذر عليهم أن يتفهموا مدى الاحزان والآلام التي تثيرها الحداثة في نفوس الأصوليين لأن التحديث لم يكن في كل أشكاله تحريرا وعتقا من التخلف والجهالة والخضوع لسطوة الماضي, ولكنه تحقق كذلك عبر هجوم عدواني علي المقدسات الدينية, مرجعة اندلاع المعارك في سبيل الإله لمحاولة ملء خواء قلب المجتمع المؤسس علي العقلانية العلمية وأن المؤسسات العلمانية كان باستطاعتها بدلا من توجيه السباب إلي الأصوليين توجيه النظرة الثاقبة نحو ثقافتهم المضادة لفهمها. I first heard Karen Armstrong interviewed on NPR while driving to the airport. Captivating! She is easier to listen to than read! Her knowledge on the major religions of the world is profound! It took me several months to read and attempt to absorb this book and is one that I should re-read again. I find it very disturbing and sad that most of the hate,intolerence-wars and prejudices are centered on religion. "If we imprison ourselves in our dogmatic ideas, we are closing our minds to the divine. I first heard Karen Armstrong interviewed on NPR while driving to the airport. Captivating! She is easier to listen to than read! "If we imprison ourselves in our dogmatic ideas, we are closing our minds to the divine. The Taoists used to say that it was nonsense to argue about religious truth, insisting aggressively that this could not mean that. What holds us back from an experience of God or the Sacred is our egotism. When we interject ourselves too much into our opinions, we are simply imprisoning ourselves in the ego we are supposed to transcend and making it impossible to have a truly transcendent experience." This is not a book you can skim. It is dense with unfamiliar names and unfamiliar history. The type is small and the lines are close. It has 43 pages of sources. In short, if you are reading for information, you couldn't ask for a better book because it is also written well. Armstrong's thesis is that the current fundamentalist movements in American Christianity, Iranian and Egyptian Islam, and Israeli Judaism have nothing to do with a return to the historic roots of the "people of the book." Ins This is not a book you can skim. It is dense with unfamiliar names and unfamiliar history. The type is small and the lines are close. It has 43 pages of sources. In short, if you are reading for information, you couldn't ask for a better book because it is also written well. Armstrong's thesis is that the current fundamentalist movements in American Christianity, Iranian and Egyptian Islam, and Israeli Judaism have nothing to do with a return to the historic roots of the "people of the book." Instead, their fundamentalists are desperately trying to reconcile the logic and scientific method of the Enlightenment with the mysteries of their religions. Before the Age of Reason and its "logos" became dominant in the western hemisphere, people assumed the "mythos" in their religion--accepted that the spiritual world was expressed symbolically. Only when the need to explain stories in terms of factuality became widespread (I think when education became universal) did the striving to reconcile the stories of the Bible, the Koran, and the Torah with science and reason become a battle. A History of God by Karen Armstrong is quite fascinating for the grandeur of its scale, a history of the concept of god and the tracing of its evolution 4000bce to the present. 1) The meaning through negation that happened in the 20C (a cat is a cat because it is not a dog) has its roots in the 11C islamic theology discussion about God and how to describe him, leading to the idea that GOD being beyond our comprehension, A History of God by Karen Armstrong is quite fascinating for the grandeur of its scale, a history of the concept of god and the tracing of its evolution 4000bce to the present. 1) The meaning through negation that happened in the 20C (a cat is a cat because it is not a dog) has its roots in the 11C islamic theology discussion about God and how to describe him, leading to the idea that GOD being beyond our comprehension, can only be described in negatives, which will not-confine him to the comprehensible positives of the language. A strand of Jewish thought picked it up from here and developed the idea of expression in apophastes: e.g. God is more than wise. What a fantastic look at the history of all three Abrahamic faiths. Full of great and useful information, this book takes a great and objective look at the rise of fundamentalism in all three faiths. Armstrong does a great job describing "mythos" and "logos" in a way that brings all kinds of relevance to the historical conversation. Some of the other reviews seem to be highly critical of her use of the terms, but it seems as if those are holding the terms too tightly (ironically enough, from a v What a fantastic look at the history of all three Abrahamic faiths. Full of great and useful information, this book takes a great and objective look at the rise of fundamentalism in all three faiths. Armstrong does a great job describing "mythos" and "logos" in a way that brings all kinds of relevance to the historical conversation. Some of the other reviews seem to be highly critical of her use of the terms, but it seems as if those are holding the terms too tightly (ironically enough, from a very "logos" perspective) and not letting them breathe to add some framework that attempts to communicate the great differences that separate the ancient eastern perspective(s) and what happened with the modernization and westernization of the world. One of my favorite points of Armstrong's book was her suggestion that there is great danger in using the "mythos" of our faith as if it were "logos". In this book, Karen tries to give a relation between fundamentalists and secular people in the three Abrahamic faiths. She discussed few basic sects of three faiths in detail. 1. A reader can get a comparative analysis of three faiths. 2. She went on to discuss the details not discussed/listed properly in few history books. 3. One can get a good glance of the cities and people of three faiths' association with them. 1. Karen tried to remain neutral in her discussion of three faiths but failed at times as she did not list the true events of history. 2. She discussed it like a narration which does not involve the audience. 3. At times, she looked like a pro-secular who tells the stories of the atrocities of fundamentalists. Armstrong is a philosopher and a historian. . . and a good writer, too. Oh, she once was a nun! Is there no end to this woman's abilities? This book is particularly good. She explores the history of fundamentalism. Her basic argument is that, in times of great change, people turn to absolutes. Fundamentalisms of all sorts provide one form of absolute. What with something like 500 years of examples, Armstrong is able to convince. It also helps that she could neatly sum I highly recommend this book. What with something like 500 years of examples, Armstrong is able to convince. It also helps that she could neatly summarize about 100 years of philosophy in 8 pages. I read that section of the book and thought to myself "It took me six years as an undergraduate to get this, and she's got it all summed up neatly, concisely, and very accurately! Not fair!" Not that it's supposed to be fair. Karen Armstrong isn't the only one to look at fundamentalism, but she does so in a way that others haven't. Not only does she go into the necessary dates and history, but really takes pains to go into the feel, passion of each fundamentalist movement in Judaism, Christianity and Islam. At some point it gets too cumbersome and verbose and this thick book became something I knew I wanted to read merely for the understanding and knowledge, but not because it flowed, and nor did I look forward to re Karen Armstrong isn't the only one to look at fundamentalism, but she does so in a way that others haven't. Not only does she go into the necessary dates and history, but really takes pains to go into the feel, passion of each fundamentalist movement in Judaism, Christianity and Islam. Her work has been translated into 45 languages. In 2008 she was awarded the TED Prize and began working with TED on the Charter for Compassion, cre Karen Armstrong, a comparative religion specialist is the author of numerous books on religion, including The Case for God, A History of God, The Battle for God, Holy War, Islam, Buddha, and Fields of Blood, as well as a memoir, The Spiral Staircase.